Screenplay: Craig Borten, Melissa Wallack. Starring: Matthew McConaughey, Jared Leto, Jennifer Garner, Denis O’Hare, Steve Zahn, Michael O’Neill, Dallas Roberts, Griffin Dunne, Kevin Rankin, J.D. Evermore. There has been no better or more consistent actor over the last few years than that of Matthew McConaughey. It’s a fact! From someone who started a bright early career and worked with the likes of such quality directors as Richard Linklater, John Sayles, Steven Spielberg and Robert Zemeckis, he soon drifted into the dreaded rom-com territory that’s no better than drifting into obscurity altogether. His reputation wasn’t amounting to his early promise and it seemed he would never recover. So when did it all go right for him then? Well, in 2011, he got back in tow with Linklater to do “Bernie” and followed that up with dark and blisteringly brave performances in William Friedkin’s “Killer Joe“, Lee Daniels’ “The Paperboy” and Steven Soderbergh’s “Magic Mike“. It didn’t stop there, though. He continued his solid work in Jeff Nichols’ “Mud” and a brief but excellent role in Martin Scorsese’s “The Wolf Of Wall Street” before finally delivering this awards laden performance in “Dallas Buyers Club“. The resurrection of his career is complete and McConaughey’s work has now, rightfully, gained the respect of critics and viewers alike. The true story of Ron Woodroof (McConaughey), a hard-drinking, homophobic, Texan Rodeo Rider who discovers one day that he’s HIV positive. He’s given 30 days to live but he point-blank refuses to accept it and learns all he can about the disease and gets involved in backmarket medicine that’s been proven to help – instead of the government issued treatment that was actually harming patients. In making it to the screen, the extraordinary true story of Ron Woodroof was one that was fraught with production problems. In the mid 90’s it had Woody Harrelson attached to the lead with Dennis Hopper on directing duties before it’s financial backing fell through. It then crossed the path of director Marc Forster with Brad Pitt taking on Woodroof. That also fell through before Craig Gillespie and Ryan Gosling entered into talks in 2008. Before anything was decided French/Canadian director Jean-Marc Vallée signed up and cast Matthew McConaughey in what’s, arguably, the most powerful role he’s ever had. Ron Woodroof is a fascinating character and McConaughey’s embodiment of him is a tour-de-force performance. Dropping 47lbs, McConaughey’s transformation is astonishing. He looks gaunt, withered and seriously ill and masterfully captures both the impending fate of Woodroof and his drive to survive. In order to survive, though, he had to go against medical practice and fight for the right to treat himself with drugs that were unapproved by the government. In doing so, he became somewhat of a saviour to AIDS victims across America during the 80’s despite the government and the law fighting him at every step. It’s an extraordinary story that’s depicted with heart and passion and being shot on a relative shoestring budget, adds to it’s palpable sense of realism. Granted, with a script that’s lay in limbo for 20 years or so, there are some creaks and cracks and some slight distortions of facts and dramatic licence on show but this is a film that has a voice and one that demands to be heard. In fact, it’s still relevant today. Not just for the community of HIV sufferers but across the treatment of many illnesses. An example being, the government’s refusal to accept that cannabis can be used for medicinal purposes and that it’s oils are known to help in cancer treatment. This, of course, doesn’t suit the pharmaceutical companies and the business to be made from their “legalised” products. Comparisons have been made between “Dallas Buyer’s Club” and Jonathan Demme’s “Philadelphia” but I reckon the comparison extends further to Michael Mann’s “The Insider” and another example of the small man fighting corporate business, as Jeffrey Wigand did with the tobacco industry. Comparisons aside, this is still a strong piece of work and it benefits massively from it’s committed performers. Too often an actors physical transformation can suggest that that’s enough to merit a great performance but McConaughey is more than that here. His acting, really is, top quality stuff and he’s supported by Jared Leto with equally impressive commitment. These two actors have been sweeping the awards boards of late and if they go on to win the Oscar, I certainly wouldn’t be arguing about it. Trivia: Jared Leto lost 30lbs and stayed in character as Rayon throughout filming. At one point, he went grocery shopping in character at a local Whole Foods where he received numerous stares and double takes. This entry was posted on February 11, 2014 at 10:45 am and is filed under Biography, Drama with tags 2014. You can follow any responses to this entry through the RSS 2.0 feed. You can leave a response, or trackback from your own site. Thanks Cindy. Matt’s transformation does echo the works of Bale for sure. Besides the impressive weight loss, though, I thought his performance was sublime. He should take the Oscar for this. He should, but my hunch is it’s Leo’s turn this year. Could be! I thought Leo was fantastic as well but if I had to choose, I’d go with McConaughey. Great review, Mark. Agreed on every point. A few small problems here and there notwithstanding, this is very good. And the actors are intense and impressive. Thanks Josh! There were a few hiccups that stood out for me narratively and I thought the ending was slightly rushed but the actors were spot on, man. I’m hoping McConaughey takes the Oscar for this. He deserves it. As well as recognition for all his work over the last few years. Agreed. And I think he’s all but a lock for that award. So is Leto, I think. I’m not so sure about Leto. I thought his performance was great but his character was a little stereotypical and underwritten. That could go against him come Oscar time. I’m still leaving towards Fassbender but whoever wins, it’ll be hard to argue against them. I didn’t have nearly as much issue with his character as some others did. A bit stereotypical? Maybe. But I think there was some nuance, too. Besides, I think the Academy often separates character and actor. 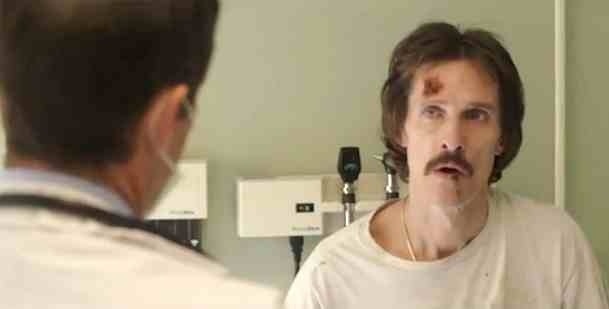 So I think both Dallas Buyer’s Club actors are all but slam dunk victories. We shall see, though. If Leto doesn’t win, I’d have no issue with Fassbender’s victory. Though personally I’d give it to: 1. Leto, 2. Barkdad Abdi and then 3. Fassbender. Is Abdi really that good? Man, I really need to se Captain Phillips. I’ve been putting that off for ages. High praise sir! The movie itself has some flaws, but the actors are not one of them. High praise again sir. I’ve heard a lot of people say that it’s shocking Hanks wasn’t nominated. My favourite of the year was actually James McAvoy in Filth but sadly, it will never be. Great review, glad to see McConaughey getting some praise for this and his other work. Cheers Vinnie. It’s brilliantly to finally see McConaughey realise his potential. The man’s on fire at the moment. The film did an excellent job of portraying the extent of humiliation, fear & even a bit of the hysteria over aids in the late 80’s. McConaughey was so thin it was uncomfortable for me to watch him. Amazed at how a few pounds can spell the difference between good & bad looks. Great points Marc. It did capture the hysteria of the time and McConaughey looked so different didn’t he? I’m loving his commitment to his roles these days. Great review, Mark. I wasn’t as imporessed with this movie as a whole but it’s hard to deny McConaughey’s impact. He’s superb. Didn’t know of all the actors and directors that were once attached to the project. That’s very interesting. Cheers Fernando! The did have a few issues but I’m with you on McConaughey. He was outstanding and a certainty for the Oscar surely? Yeah, I think he’ll win. Although I’d be thrilled if Leo won. He was superb. Leo was outstanding too. No doubt about it but I just think that McConaughey delivers a bit more dramatic power and the academy tend to love that stuff. You’re right. They tend to overlook comedies, too. So while Wolf got a lot of noms, I don’t think Leo will take it. Still, I won’t be upset with Matt’s win. I was a massive fan of Wolf and still think it’s a better film, deserving of it’s nominations. I wouldn’t grumble about Leo taking it as it’s long overdue but for me it’s Matt. Long overdue, indeed. But yeah, both men are deserving. I also loved Bale and have yet to check out Dern and Ejiofor. Dern’s the only one I’ve yet to see but they’re all good. Dern would have to be exceptional to take it, I think. Great review. I had a few problems with the film but the performances by McConaughey and Leto really elevated it, in my opinion. Thanks Laura. I had a few problems myself narratively but there’s no denying the impact that Leto and especially McConaughey had. Outstanding work! If anything, this movie is totally worth seeing for what Leto and McConaughey are able to do here with their roles and the material they’re given. Nice to see that they’ll probably get some awards-love out of the bargain, too. Good review Mark. Thanks Dan. It certainly looks like the Oscars are going to award at least one (if not two) of these fantastic performances. They really were special deliveries. Interesting. Like the comparison to The Insider Mark. Glad you got a kick out of this too. We’re on the same page again! Top marks. Cheers Mark! “Top Marks” you say? We could come up with a joint feature on that title? Thinking cap duly placed on head. Nice review. 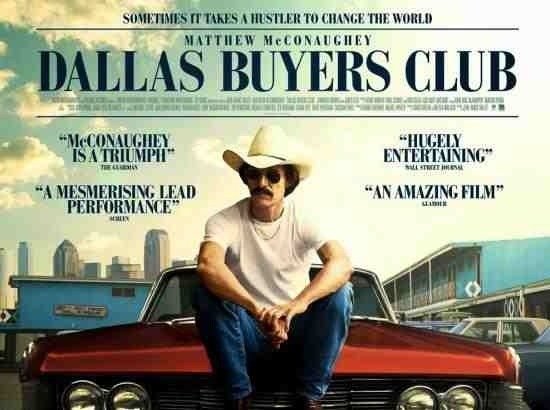 Still need to check this out but I’ve heard nothing but praise for McConaughey’s performance. I know this has been said a million times before, but he’s becoming one of the best actors today. Thanks man! Everything that’s been said of McConaughey is thoroughly deserving. He’s outstanding in this film and I certainly having him riding high on my list of favourite actors working today. He miraculously gets better and better with every film. Really good review! I thought the film was excellent and was blown away by both McConaughey and Leto. Poignant and actually pretty funny, which was charming. Great stuff! I was blown away by the performances too – especially McConaughey and your spot on about the humour. I also found myself laughing when I didn’t expect to at all. Great film. Thanks for dropping in. Great review, so glad to read this much praise for Matt, I’m really hoping he is going to take Oscar for this and continue to give more of such great performances. Cheers Sati. I’m hoping McConaughey takes the Oscar too. There have been some outstanding performances over the year but Matt’s is definitely the most powerful. Just can’t get enough of this guy right now. I can see people comparing this to Philadelphia but this one felt more raw somehow. I’d see it for McConaughey’s performance for sure. I think he’d take that Oscar home this year. It does have shades of Philadelphia like the injustices and prejudices that aids suffers face but it was the struggle of it that reminded me of The Insider. Great film, Ruth, and one that McConaughey deserves the utmost credit for. Absolutely awesome review Mark! Hoping to finally watch this over the weekend, but we shall see! Thanks Zoe. I hope you enjoy it as much as I did. Excellent review and I loved the intro about the rebirth of McConaughey’s career. Thanks Abbi. I left out mentioning The Lincoln Laywer as, even though it was good film, it still had Mconaughey doing a straight role whereas all the others mentioned, he started to push himself more. It’s been a great reversal of his career over the last few years. Long may it continue. I agree about The Lincoln Lawyer. It was a good performance but I think I even wrote in my review that it was just McConaughey playing the same guy yet again. Exactly! It’s was a nice change from the rom-com’s but he really wasn’t challenging himself. After that though, he was flying. Cheers Chris. McConaughey’s King Midas right now and I, for one, am thoroughly enjoying his stuff. Great review Mark. This is a very impressive film and my personal favourite of the Oscar’s selection so far (I’m yet to see Her). McConaughey is on top form and certainly deserves the best actor trophy. My favourite of the year is actually Her. Should have a review tomorrow. Rock solid review Mark. I thought this was a pretty good movie but the real gold is in the performances. I felt the story itself begins to splinter in the second half but even during that time the performances remain top notch. Cheers Bro. Totally agree that gold is the performances. I struggled a bit with the dramatic license and the rushed ending but McConaughey was simply sublime. I thought Leto was great too but his character was a little stereotypical and drafted in to jerk the tears I thought. Great piece man, you already know what I’ve said about it and it’s much the same as this. Good note about the physical transformations, as well. That part is shocking, yes, but the performances speak volumes above just a physical change. It’s great to see and made the emotional quota that much higher. A powerful film for sure. Cheers Tom! The physical transformations are certainly impressive but the performances do go over and above that. I found Leto’s character a little stereotypical but McConaughey was just class, man. My wife and I were utterly moved and floored by this film. Leto and MM were astounding to behold. Good job, Mark. Astute write up, man. Thanks Vic. It’s a strong film for sure and both the performances were superb! They certainly deserve their places amongst the nominees this year. Damn good chance they’ll win it too. Maybe so, my man!… Maybe so! Tyson comes back from obscurity to praise Jared Leto! Jared and Tyson sitting in a tree, K-I-S-S-I-N-G! He’ll be making out with an Oscar winner by then! You know it Fernando!! 🙂 I’m working the night of the Oscars so I’m expecting you to keep me updated. McConaughey fans take note! His best may not be “Dallas…” but “True Detective” currently on HBO. I know it’s a TV series but my wife and I say it’s “must see”. His co-star and co-producer is Woody Harrelson. Powerful stuff and “Oscar” calibre acting from both stars. Mark, if you’re a McConaughey devotee this could easily become a favorite. Excellent review as always. Hey Ray, nice to see you, man. I have been converted into a McConaughey devotee. I think his performances have been of an exceptionally high standard over the last of years and believe me, once I get my mitts on “True Detective” I’ll be all over it. It looks fantastic and can’t wait to stuck in. Thanks man! Great review of an amazing movie. Only thing which annoyed me in the movie was the poster of the Lamborghini in the hotel…this was set in the eighties and nineties, but the poster was of a present day Lambo…. Nice review Mark. We’re in agreement on this one. Cheers Amon. It’s a great film. Flawed, but still very well delivered.